Washing and cleansing my face in the evenings is my favourite part of my skincare routine… I just love the feeling of having clean skin, and it feels so nice to take my makeup off. Double cleansing is something I do every night, or at least every day that I wear makeup. The first cleanse gets rid of all my makeup, and the second cleanse makes 100% sure my face is really clean. The second cleanser can be more targeted for my skin concerns at the time. Lately I’ve been taking everything off with the Clinique take the day off cleansing balm, which basically looks like lard in a pot. Mmm. It’s unscented and sort of melts into an oily balm when it touches your skin. It really does help to take everything off, and after I rinse it off with a flannel. After that, I’ve been alternating two other cleansers. 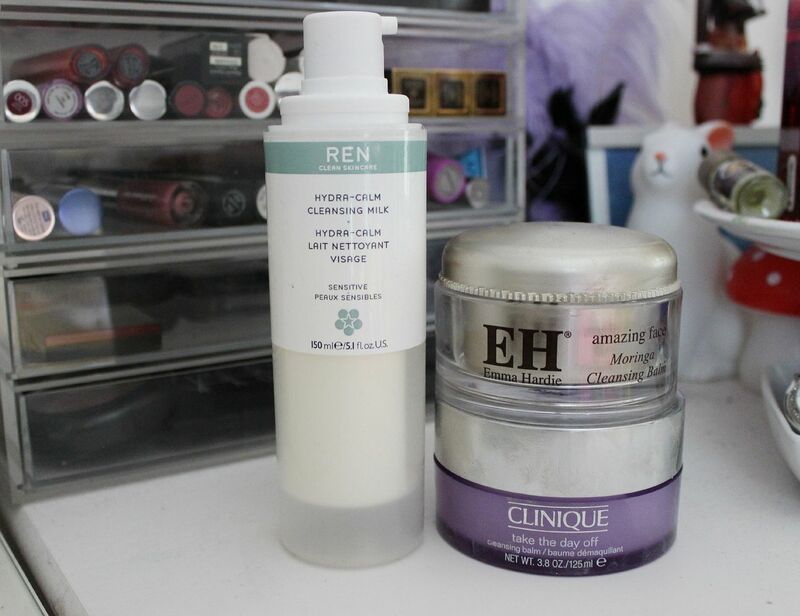 They don’t offer particularly different effects, but either the Ren hydra-calm cleansing milk or the Emma Hardie cleansing balm will do. I wash it off with a flannel as well, and then my skin feels both really clean and nourished. Follow up with toner/oil/moisturiser and then I crawl into bed… mmm, I’m sleepy!